Was a lively evening , becoming more lively as the Belgian beer, mussels and frites with garlic aioli were sucked down! Special thanks to psychchef for setting up a great evening. It was great to have an opportunity to taste and examine so many different single malts next to each other, especially since none of these are scotches that I have in my cabinet at home, or rank among my favorite (mostly due to inexperience). I found my tastes for the evening skewing towards the peatier side, particularly enjoying Lagavulin and Oban. Of all the ones we tasted I'd be most likely to buy a bottle of Lagavulin again. It has the most complex and full-bodied flavor for my palette. With Lagavulin, a splash of water truly illustrated what it means to "open up" a scotch, allowing for all of the interesting flavors to be appreciated. I give an "honorable mention" to Highland Park which has no notes of smokiness or peat, but has an interesting sweet honey flavor. Hopleaf changed it's menu a couple weeks ago, and I was disappointed in the food there for the first time ever. Frites w/aoili and Mussels were spot-on and enjoyed by all, but my pheasant entree was tough, sinewy, and dry (I bent my fork trying to get meat off the breast). Ms. EC's beef stew had a full flavor, but the meat was stringy and tough. Perhaps they're still learning what works on this new menu or maybe we just hit a bad spot. I know others enjoyed their entrees much more than we did. The combination of a wide-array of scotches, Belgian beer, food, paczki, and LTHers made for a fantastic evening. Who needs a scotch expert? "There is probably no better place to start a grand tour of...Scottish malt-whisky distilleries than in the Orkneys, not necessarily because the very best whisky is made there, because it isn't....No, it is because the fate and the practices of its two distilleries can be seen as a microcosm of the industry as a whole. "On the one hand there is Highland Park, a traditional, big-stoned twin-pagoda, Victorian-style distillery, right down to its unique and mysteriously 'Y' shaped active floor maltings, which enjoys a worldwide reputation for its velvety, heathery make. On the other, there is Scapa. Except for blenders and a few connoisseurs in the know, it is virtually unheard of, despite the fact that the maturing spirit in its warehouses is rarely anything less than excellent." Murray goes on to note that Highland Park cuts their peat from the local Hobbister Moor; this peat is then used to smoke malt to a heavy phenol level of 20 ppm. The smoked malt is then mixed with unpeated malt which results in what Murray calls "an Orcadian delight, with a delicious heatheriness and a full, sweet understated smokiness." Scapa, in their efforts to make their product attractive to blenders, uses totally unpeated malt, yet a hint of smokiness comes through all the same. Of the two, I found Scapa to have a greater depth of character, with a broader range of flavors represented. The Scapa was a 14 year while the Highland Park was only a 12, an aspect I will come back to with Laphroaig and Glenmorangie. Next up was the Talisker 10 year, from the Isle of Skye, which despite its young age displayed a surprising amount of maturity and a prolonged finish. Talisker plays a key role in the blends of Johnny Walker, according to Murray single malt bottlings of Talisker bore the Johnny Walker logo as recently as the 1980s. Talisker also figures into one of my father's favorite liqueurs, Drambuie. I enjoyed the Talisker more than the Oban, but this makes them seem more similar than they are. The Talisker is thinner and peatier than the Oban, but the Oban is a 14 and the Talisker only a 10. Talisker's phenol levels are 25 ppm, less than the Laphroaig and Lagavulin, but more than any of the other scotches that we tasted. The Oban was quite smooth, considering that Gary got this at Sam's during their scotch sale, this may be the deal of the bunch. Oban is one of the only legal distilleries in the Western Highlands and has been in operation since 1794, making it one of the world's oldest. The Glenmorangie 18 year that we had was a real treat. It's almost unfair to consider it alongside the other scotches as the extra cask time makes a significant difference. If someone wanted to know what scotch was, I might point them towards this, if only because it balances the elements of scotch flavor so effectively. This was the only scotch we tasted with hints of citrus that I could identify. Now to the Islay distilleries, Laphroiag and Lagavulin. The Laphroaig, as Trixie-pea noted, is the kind of think you either love or hate. It is so heavily peated that doctors were allowed to prescribe it during Prohibition because of its strong iodine 'medicinal' taste. The 10 year old we had is probably the most readily availabe of Laphroiag's bottlings, but if you enjoy its' character, seek out the Cask Strength bottling, which isn't chill-filtered. Personally, I find the Laphroiag 10 to be too much like medicine to enjoy. I appreciate its qualities, but I feel that the Cask Strength bottling and our next scotch, the Lagavulin 16, present the same heavily peated profile in a more complex, interesting way. The Lagavulin 16 was another special treat, as its popularity has made it hard to come by lately. The Duke of Perth is out of stock, for example, and it may be months before they can get more. This was the biggest, most assertive scotch we tasted; Jim Murray says, "Be warned, it is not a malt you simply sip; it devours you." I would tend to agree with this sentiment. I had to partition off the Lagavulin and Laphroaig from the rest of the tasting because they would so easily overpower the subtlety of the Highland Park or the Glenmorangie. This is a delicious scotch, 16 years is a great age for it, I wonder how the Laphroaig would compare if it had the extra cask time. The Aberlour 10 was the most complex of the 10 year scotches we had. I found it to be smooth and relaxed. This is a Speyside distillery, along with Glenlivet and Macallan, and while I might not pick it over the 15 year Glenlivet French Oak Finish or the Macallan cask strength, for a 10 year it is a delicious, creamy offering, one that I would love to have around the house. The Glenlivet French Oak Finish that I brought was the one I paid the least attention to, probably because it was the one I got to bring home with me. Considering it alongside the Glenlivet 18 year, which costs a little more than twice as much, it is quite a contender, but it doesn't have the same depth of flavor as the Lagavulin or the Glenmorangie. Psychchef and everyone else who brought scotch, I can't thank you enough for a great event. This was my first LTH get together and I look forward to the next. Although these were the "official" Scotch's that we tasted, we also had Glenlivet, Abelour, and Scala. With that being said, this is how I would rate them in terms of flavor character (from mild and sweet to peaty and smoky). I have to say that I liked all of them, and for me, it's hard to choose a favorite one. They are all so different, each with its own character. The Micheal Jackson book that we used as a reference has Robert Parker like ratings (1-100), and I just can't imagine being able to objectively rate a Scotch on a point system. The Talisker was by far the most distinctive - volcanic was one description that I found to be accurate--powerful, and so smoky as to almost drown out all other flavors. On the opposite end of the spectrum was the Highland Park which, IMO, had almost no defining characteristics. And that is not to say that it wasn't good, but rather that it was very round and even with no single note drowning out any other. Some would say that it was boring, others say it's just a great all-around crowd pleaser. The Lagavulin and the Laphroaig, for me, were the most interesting Scotch's that we tasted. They are both from the same region (Islay) and also from the same district (South Shore). I heard more than one person say they were picking up some salt and even seaweed in both Scotch's. When roasting the barley used to make scotch, whatever gets thrown in (on purpose or by chance) to the peat fires, will sometimes show as a flavor/aroma note in the scotch itself. So, it would make sense that the Islay Scotch would have a bit of seaweed in the peat, and that would in turn lend a slight salty sea flavor to the finished product. 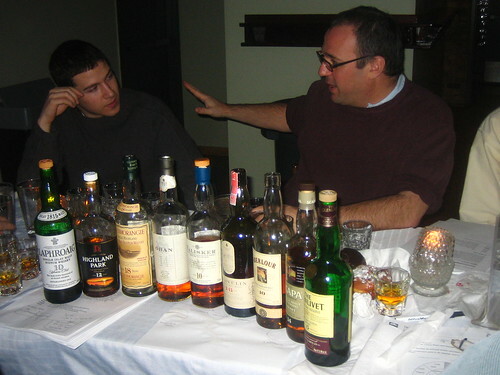 We talked about how most people either love or hate the distinctive peaty flavor of Laphroaig. Personally, I did not fall into either category, but I will definitely add it to my home collection and continue to try it. We were not planning on having the Glenmorangie in the tasting because it was a little older, and maybe not the best to compare the others on a one to one basis. However, it was nice to taste what the aging process does to a Scotch. This scotch had a much lighter, more feminine taste. I tasted vanilla, honey and nuts. As far as the food went, the mussels and frites were fantastic and their bread that they served was decent! Red Hen? I had the Nueske Ham sandwich which was huge, but tasty. I like Nueske pork products, especially their slab bacon. I tried some of pigmon's beef stew, and like eatchicago, I thought it was sub par at best. I had such a great time meeting everyone. And although I think everyone enjoyed the Scotch, it was less of a formal Scotch tasting than it was a party where you did a little bit of learning which, as far as I'm concerned, a party is always better. Psychchef, thanks again for taking care of all of the details! 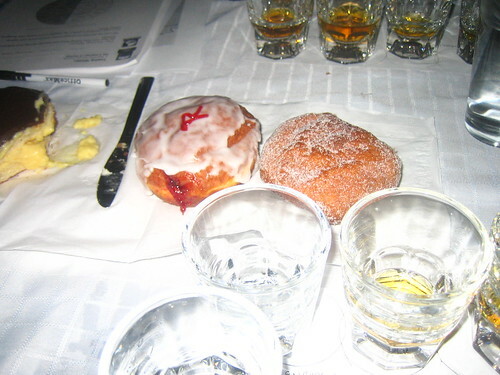 Scotch tasting was educational, interesting and, as befitting a Scotch tasting with paczki on the side, fun. Though we did not have an expert to guide us Psychchef printed individual informational packets on each of the Scotch in the formal tasting, along with a comprehensive overview. Kudos to Psychchef for preparedness. In addition to Psychchef, Trixie-Pea, EatChicago, Joseph and Unbeknoweth added to the knowledge base. I added to the paczki eating base. 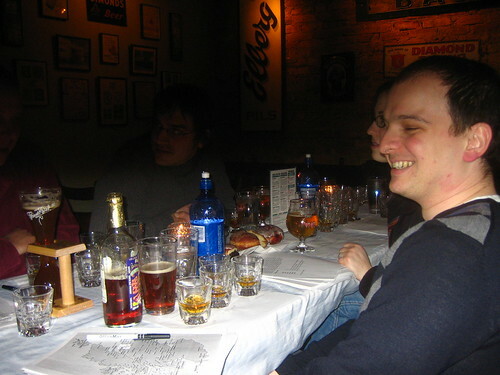 We formally tasted 6 Scotch, with 3 additional for a total of 9. My personal preference was for Lagavulin. There seemed, as in the Glenmorangie and Talisker, a lot going on, but with the Lagavulin there was a cohesiveness lacking in the others. My off the cuff comment was Lagavulin was what Talisker will be when it grows up. For easy drinkability my favorite was Highland Park, with Talisker my least due to it's cacophony of flavors, of which medicinal was predominate. While some liked the Glenlivet French Oak 15 year reserve, I found it a bit smooth for my taste, similar to the way I prefer Reposado tequila to Anejo. 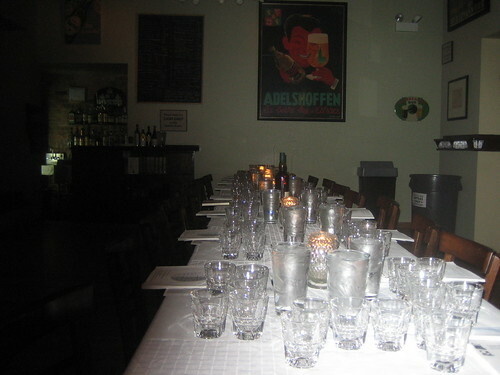 Hopleaf outdid themselves in graciously allowing us the use of an upstairs private room, providing ample glasses, water, efficient waitress service and making us feel welcome, kudos again to Psychchef for organization. Mussels and frites were, as always, quite good, but the surprise of the evening were the very tasty onion rings, which Unbeknoweth kindly shared. Thanks again to all, it was a wonderful evening, interesting conversation, good food and drink, seeing old friends and making new.